The second general entertainment channel from Star India, Life OK will be relaunched as Star Bharat on August 28 at 6 pm. The new channel will have a new look, name, positioning and programming. The channel’s philosophy is ‘Bhula de darr’. Except for the crime show Savdhaan India, the channel will have a completely new programming line-up with four new shows. This is the second time that Star India is revamping its second channel, which was originally launched in November 2004 as Star One. In December 2011, the channel was relaunched as Life OK.
Star Bharat will showcase inspirational stories about journeys of strong and fearless characters that rise for the collective. The four shows that channel will kick off with are Om Shanti Om, Kya Haal Mr Panchaal, Nimki Mukhiya, Saam Daam Dand Bhed and Ayushman Bhav and the existing Savdhaan India. Om Shanti Om is a blend of devotional music with a contemporary twist. A devotional music reality show where tradition meets trendy, creating ‘trenditional’ music. Produced by Colosceum, the show will mark the debut of Baba Ramdev on television as the Maha Judge. The panel of judges will include Bollywood actor Sonakshi Sinha, singer and music director Shekhar Ravjiani and singer Kanika Kapoor. Kya Haal Mr Panchaal? Is a sitcom where a mother’s quest for the perfect bride lands her with five. Created in association with Optimystix, the show is a rib-tickling comedy starring Kanchan Gupta as the saas and Manindar Singh as the son. 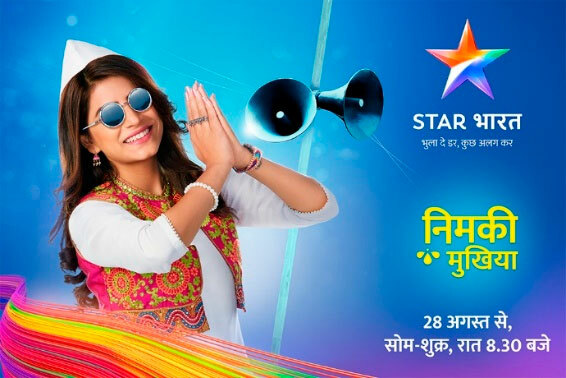 Nimki Mukhiya is set in Bihar. It is the story of a naïve and bubbly young girl, Nimki, who loves to day dream and is unaware of the world outside her house. She is about to take on the responsibility of her village and become the Mukhiya. Saam Daam Dand Bhed is the personal journey of Vijay Namdhari, played by Bhanu Uday, a high-potential but misguided youth who doesn’t know what he wants from life. This family drama, based in a fictitious town in India, is produced by Shakuntalam Telefilms. Ayushman Bhav is set against the backdrop of Mathura, depicting the poignant tale of an eight-year-old boy whose childhood is not as simple as others. Produced by White Horse International, the revenge drama stars popular child artist Ricky Patel as the lead and Avinash Sachdeva, Megha Gupta, and Manish Goel as cast members. Star Bharat’s launch campaign 'Mat kar' is based on a simple yet powerful insight on how we unknowingly allow different kinds of fears to creep into our minds and how these fears end up in stopping us from pursuing our dreams. ‘Mat kar’, an oft repeated phrase in Indian society, refers to a pull-back factor. Pulling back from free flowing fun, nurturing a dream, making a life choice or simply following one’s instincts. The film, conceptualised by Star India’s creative team and directed by Shimit Amin of Chak De fame, takes us through various scenarios, some significant and some apparently not so, all of which play on fear. Star Bharat's answer to "Mat kar" leading to fear is a resounding ‘Bhula de darr’.